Spray drying is a widely used particle formation process by which aqueous or organic solutions, emulsions and suspensions can be converted into a dry powder with a relatively narrow particle size distribution. Thanks to short contact times, spray drying is well suited even for heat-sensitive materials (enzymes, drugs). In addition, corrosive and abrasive materials can be readily accommodated because the contact between the mechanical parts and the materials is minimal as compared with other particle formation processes such as granulation. 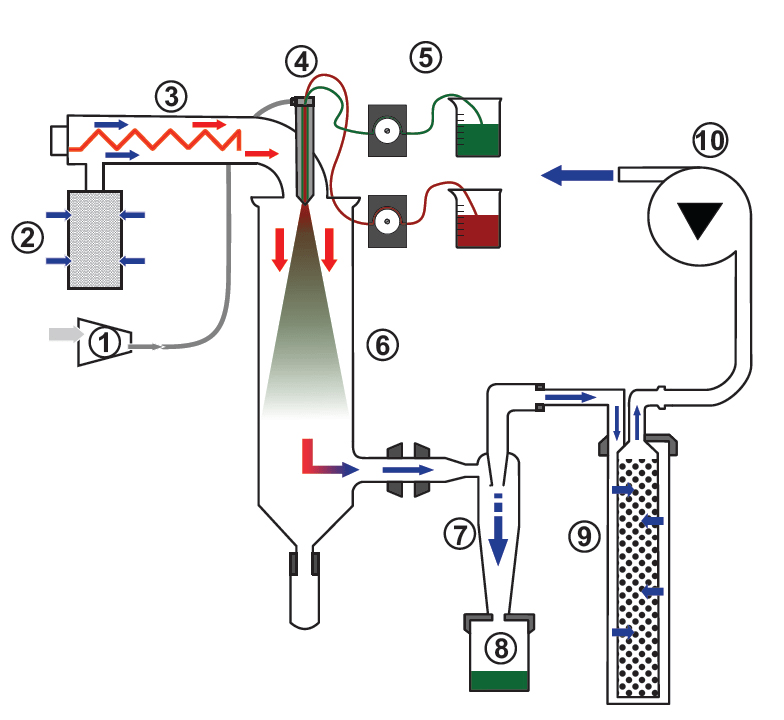 The physical properties of the resulting product (such as particle size and shape, moisture content, and flow properties) can be controlled through the selection of equipment (type of nozzle) and the manipulation of process variables (gas and liquid flow rates, atomising gas pressure or inlet temperature). A key step in spray drying is the atomization of the feed liquid into fine droplets. This can be achieved by a range of nozzle types – centrifugal nozzles for the processing of dense suspension, single-phase pressure nozzles or two-fluid kinetic nozzles for the spraying of low to medium viscosity liquids at both laboratory and industrial scale. Other nozzle types such as piezoelectric droplet generators tend to be mainly used at the laboratory scale. Relatively recently, three-fluid kinetic nozzles (Figure) have also been employed for spray drying, especially for the encapsulation of immiscible liquids such as oils or aromas in particles with core-shell structure. 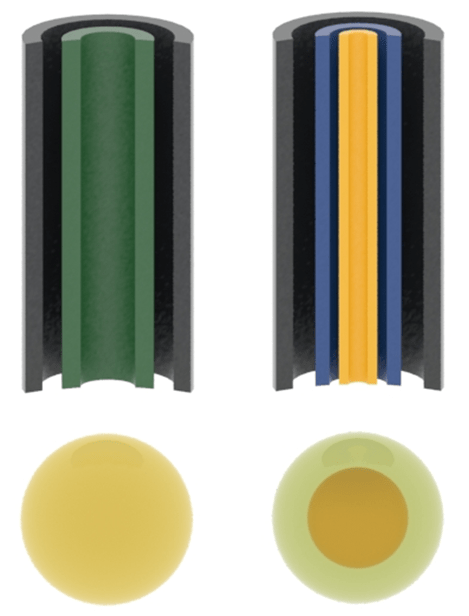 Two-fluid (left) and three-fluid (right) nozzle. Our laboratory is equipped with laboratory spray drier Buchi B-290 with high performance cyclone in open mode configuration which enables drying of aqueous solutions (Figure). Scheme of spray drier Buchi B-290 with 3-fluid nozzle (1 compressor; 2 inlet filter; 3 heating coil; 4 nozzle; 5 stock solutions; 6 drying chamber; 7 cyclone; 8 dry product; 9 outlet filter; 10 aspirator. We are interested in study of encapsulation of active substances in form of nanoparticles (silver) or proteins (enzyme laccase) dissolved in carrier’s matrix (e.g. cross-linked chitosan) or combination (substrate in the core and enzyme immobilized in the shell). The advantage of spray-drying techniques for application in microencapsulation is that it is reproducible, rapid, and relatively easy to scale up. Application of micro-carriers produced by spray drying technique.